Q. Who can carry more items, Eddie or Doraemon? A. Hmm, Doraemon with his fourth dimensional pocket, or Eddie… Well, because Eddie has a “material transfer unit” equipped within his body, he is able to relay an unlimited number of items from my laboratory… Hmm, I suppose that since they both can carry an infinite amount of items, this contest ends in a draw. Q. When coming up with new characters, are they ever based on real people? A. The answer to that certainly differs with each game. I’d say there are both characters who are based on certain persons, and also some that are completely original! And that goes for voices within the games as well. Sometimes Capcom comes up with the voices themselves, other times they will use a seiyuu they’ve heard in an anime or other mediums and decide to use their vocal talents to shape the character. By the way, Chun Li is one of my favorite characters, and her voice is done by one of the Capcom development staff members! Q. I recently purchased the Street Fighter II CD, and I was wondering if there was any meaning behind the name “Alph Lyla“? A. Have you heard of the story Arabian Nights? Actually, the story’s literal name is “One Thousand Nights and One Night”. In the Arabic language, “alf layla” means “One Thousand Nights”, and that’s what the group’s name is taken from. I’ve also heard it said that there’s an additional meaning they had in mind, “a thousand nights, a thousand dreams to be dreamed.” Rather poetic, isn’t it? Q. What is that necklace that Guile always wears? A. That’s an army identification tag, otherwise known as a “dog tag”. It is a memento that belonged to Nash, a fellow soldier from his unit. Guile carries it with him as a symbol to remind him that Nash will always be fighting by his side. Q. Does Capcom have a mascot character? A. Hrm, well, my own creation “Rockman” and the characters of “Street Fighter II” have become the popular public faces of Capcom. However, in America, “Captain Commando” is another commonly used mascot character for Capcom. Perhaps you’ve heard of him? Q. How does Eddie always manage to cross paths with Rockman? A. This is due to an invention of mine. 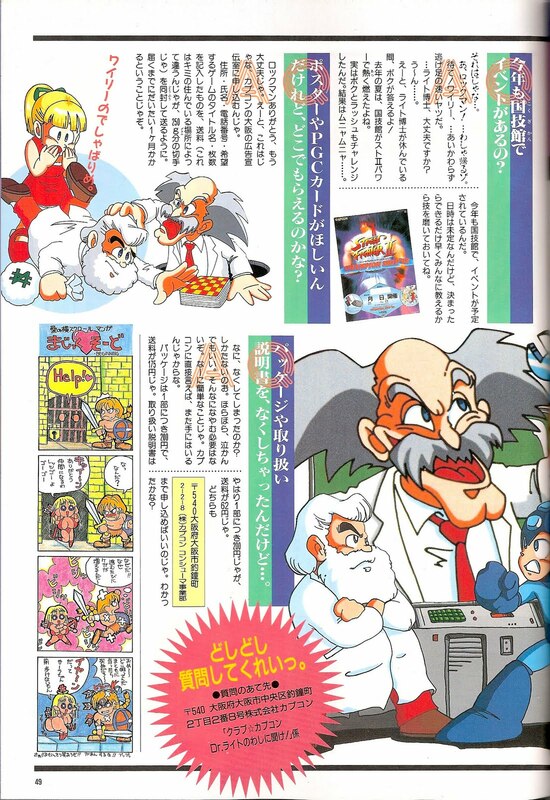 I won’t go into too many details, in case Wily were to try and steal its secrets, but I’ll give you a special overview! All of Rockman’s support mechas are equipped with a sensor that identifies Rockman’s exact location. Of all the abilities I’ve created for the support mechas, this one is probably the most fundamental! The sensor allows Rush and Eddie to appear by Rockman’s side instantly whenever they are needed. Q. How did you decide on the name “Rockman”? A. Well I… oof! BONK! clunk! Now then, what was your question? There’s nothing I don’t know! What? You want to know about the origins of that nuisance Rockman’s idiotic name? Predictable old Right loves his music. I’ll bet Rockman’s name was based on “Rock ‘n’ Roll”. That’s why he called the girl robot “Roll”, you see. What a pretentious moron! Q. Is there going to be an event at Kokugikan this year? Aaah, Rockman! …I think I’d better get out of here! Stop! Wily… Same old Wily, always quick to run away. …Dr. Right, are you okay? Umm, Dr. Right needs to rest for a little while, so I guess I’ll answer this one! This year, they’re definitely planning another Kokugikan event! I don’t know what day and time yet, but I’m sure it’ll be announced soon, so keep improving your skills in the meantime! Q. Where can I get my hands on Capcom posters and PGC cards? A. Thank you Rockman, I assure you I’m alright now. Oh, it sounds like you might want to make a request to Capcom’s advertising branch in Osaka. Include your name, address, telephone number, and the titles you’re looking for. You’ll need to include the cost of shipping (this will differ depending on where you live, but make sure it’s enough to ship 250 grams). You should receive your items within a month of your request’s arrival! 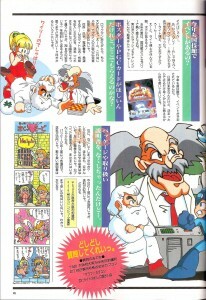 That mean old Wily is always butting in! A. What, they’ve gone missing? That’s terrible! Hey, come on now, don’t cry. Cheer up, it’ll be alright! We can fix this in a jiffy. Just contact Capcom directly, and they can send you a replacement! Game packages are 200 yen each, with an additional 175 yen for shipping. Instruction booklets are also 200 yen each, but are only 62 yen to ship. Feeling better now? 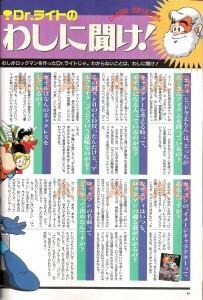 Dr. Right’s “Ask Me!” was a regular feature of Club Capcom throughout its 3 issue run. This is the only one that featured other characters besides Dr. Right himself answering questions, though. They used slightly different fonts in the article, I used colors instead. If you couldn’t tell, the characters were Right (orange), Wily (purple), Rockman (blue), and Roll (soft red). There are instructions on where to send your own questions to appear in the next magazine, but I wouldn’t expect an answer since it’s been over 15 years since the magazine disbanded. So, what did we learn? Quite a bit about Eddie, that he has an internal Rockman GPS, and how the cybernetic suitcase actually works. He has some kind of teleport system in his head that allows him to pull random objects from the lab and deliver them to Rockman in the field, until his energy runs out. To think, I always figured he carried stuff around in his head… This actually makes more sense for how he’s used in the later games. 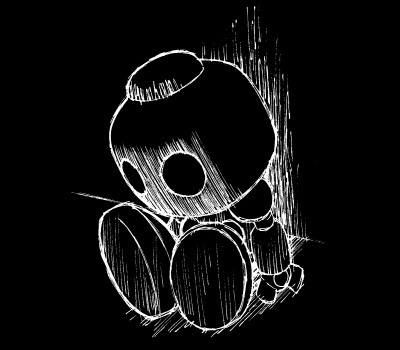 Why a question comparing Eddie and Doraemon? In Japan he was quite popular, let’s leave it at that. We also learned the significance of Guile’s neck wear, the voice behind Chun Li, the meaning of Alph Lyla’s name, the origins of musical themed Rockman characters, and how to get Capcom to send you stuff. We also gave props to Captain Commando and his space monkey (I’ve always liked this version of him better than the older one, which resembles the estranged lovechild of Flash Gordon and Dr. Doppler). And now, a question for my readers. When I go to translate other Ask Me columns, would you like me to translate all of the questions and answers, or just the ones having to do with Rockman? It’s your call. 4 Comments to "Dr. Right Explains It All"
Yay! You're on an updating-spree; good to see you up and well. But you cut me abruptly on Gmail chat that day, you lego head! Bonjour! I've been trying to keep to my update schedule, though it's awfully tempting to just skip sometimes, I must admit. Hey now, you disappeared first, mon ami. I would've stuck around if I'd known you'd be back a minute later! Say hi to Paris for me! Always cool to hear some new trivia, even if it's not Mega Man related. Besides I think many Mega Man fans are also fans of Capcom in general. I say translate it all if you have the time. Since you're the only one that made any suggestion either way, you got it CloakBass! Everything it is.